A state judge extended a restraining order against the implementation of the surcharge on Thursday. A crowd of nearly 50 taxi drivers, medallion owners, labor organizers and their supporters gathered on the steps of the state courthouse at 80 Centre Street in Manhattan on Thursday, bundled up against this morning’s 20-degree chill. Several drivers at the top of the steps held a yellow banner reading “Stop The Suicide Surcharge” in bold, black letters. Richard Chow, the brother of the late Kenny Chow who committed suicide in 2018 due to insurmountable debt was among them. His sign asked New York Gov. Andrew Cuomo to “have mercy” on yellow cab drivers. Put plainly, Albany has exercised anything but mercy on the taxi industry. It began to collapse in 2015 when largely unregulated ride-share companies like Uber and Lyft began to flood the market. Now, the Taxi and Limousine Commission is seeking to impose congestion pricing surcharges of up to $2.75 on yellow and green cab drivers passing below 96th Street in Manhattan. Uber and Lyft, however, will see a surcharge of only $0.50 — a concession that was won in the final hours of debate over the plan. Uber spent more than $100,000 lobbying for this version of the plan. 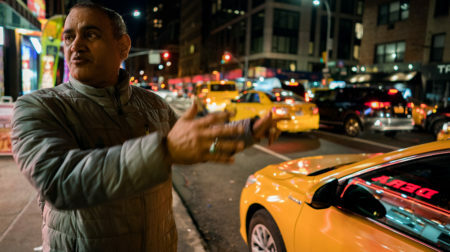 A group of plaintiffs, including both cab companies and individual medallion owners, has filed a lawsuit against the Taxi and Limousine Commission and Governor Cuomo following the decision to place the heightened surcharge on yellow and green cab drivers, who already pay a surcharge of $0.50 per ride in order to fund the MTA. New York State Judge Lynn Kotler has issued a restraining order temporarily barring implementation of the new surcharge. 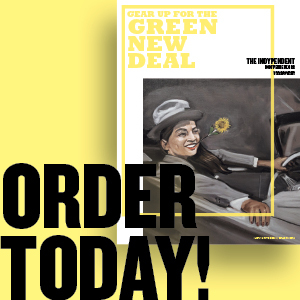 The order was extended Thursday in response to an affidavit submitted by the New York Taxi Workers Alliance (NYTWA). 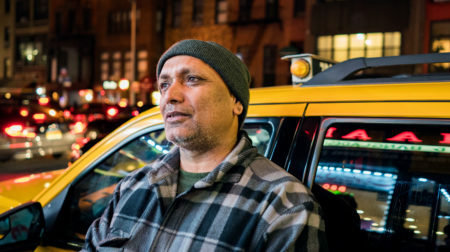 Bhairavi Desai, the Executive Director of the NYTWA, says the ride-for-hire industry is facing a humanitarian crisis with devastating, irreversible consequences for drivers and their families. City Council Member Ydanis Rodríguez of New York City’s 10th District and a Chairman of the Transportation Committee, noted that although he stands in favor of congestion pricing, he formerly drove a livery car and understands that New York City’s iconic yellow cabs and the men and women who drive them are in crisis. “I know what it means to be behind the wheel, to get some hours to make money to support myself and my family,” Rodríguez said. He emphasized that medallion owners who took out loans to purchase their licenses before Uber drove their value down need debt relief from state and local legislators. MTA Board Member Richard Lipsky, who represents the Taxi Medallion Owners and Drivers Association, and former New York City Transportation Commissioner Lucius Riccio expressed solidarity with drivers and with the NYTWA. The most poignant testimony at Thursday’s press conference, however, came from the drivers themselves. 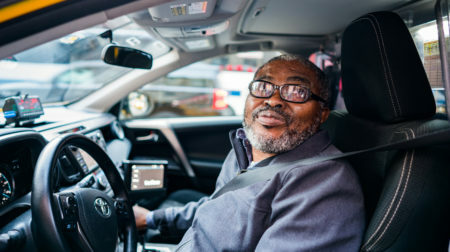 Medallion owner and driver Nicolae Hent read a list of the expenses that he pays to operate his taxi cab in New York City every year, the total coming to $12,420 — nearly 14 percent of his income. Richard Chow, brother of Yu Mein “Kenny” Chow, who took his own life last May amid growing financial insecurity, shared part of his own story. Kenny’s body was found in the East River nearly two weeks after he went missing. Photo: Taxi drivers rally against a congestion surcharge on the steps of City Hall on Jan. 16. Credit: Erin Sheridan. Fares are scarcer for NYC cabbies and automation is on their tail.